Another return trip: After three more weeks back at the Ojai Foundation my time in SoCal is up for this trip and I return to San Francisco which I had visited a few weeks ago just for a day to see a friend. He had introduced me to Glide Memorial Church, a well-known, very unorthodox and social-activist congregation situated in the Tenderloin district, an infamously rough part of town. Many of the homeless who benefit from Glide’s social programmes in fact live right on Ellis St were Glide is located. This time round, I plan to spend a night in a hostel located right on Ellis St, at the opposite end from Glide. Well, I’m not entirely aware of the distance to my hostel as the Amtrak bus driver drops me near the church late at night with all of my worldly possessions (at this point crammed into two very heavy backpacks plus two additional bags). Stingy, reasonably fit and perhaps unreasonably self-confident as I’m feeling at this point, I decide to save the money for a taxi and not bother waiting for a bus and rather walk to my hostel. I’m feeling happy to be in a familiar part of town and passing by Glide where I spent one very enjoyable Sunday morning meeting so many friendly members of the congregation warms my heart – so I’ve got a smile on my face and a spring in my step as I hoist my giant pack and end of hiking the entire length of the street that turns out to be number one hang-out / bedroom of Tenderloin’s down, out, destitute and often substance abusing residents. Whether it’s confident and relatively non-judgemental vibe I’m putting out or whether they think I’m one of them what with carrying all of my possessions around in the middle of the night – I do not receive so much as a sideways glance or comment from anyone I pass and make it to my hostel without any trouble at all. I’m feeling rather proud to have seemingly passed my right of passage in da hood, though I’m not so naive that I’d willingly repeat this social experiment. Never the less, I continue to feel very welcomed in the Tenderloin as I attend Glide’s “celebration” the next day, again having some good conversations with folks in my pew, and walking down the same street that afternoon, dressed in a t-shirt with the Glide logo that I’ve just acquired, am greeted in a friendly manner by a homeless man who recognizes where I’m coming from. 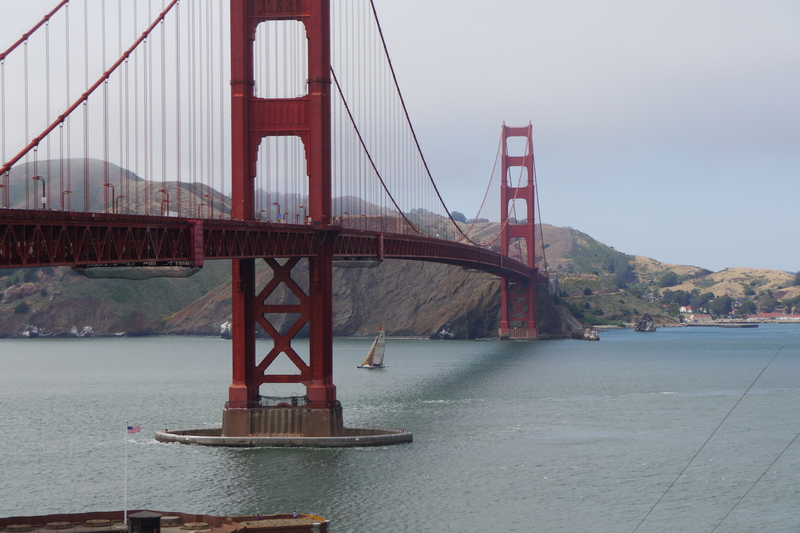 The rest of my stay in the San Francisco is devoted to following the tourist route through Golden Gate Park, China Town, North Beach and famous City Lights Bookstore and of course out to the base of Golden Gate Bridge. We also treat ourselves to a fabulous sushi dinner and outstanding show at Yoshi’s jazz club on Fillmore St. where long-time band members with the likes of Ray Charles or Santana perform on a weekly basis!